Regular meals, when children can eat and drink everything that parents think is right for their child (and that children want…) and between meals only water – is the only real way to achieve a healthy dentition. At least once a day, in the evening before bed, parents should help their children brush their teeth with a fluoridated toothpaste. 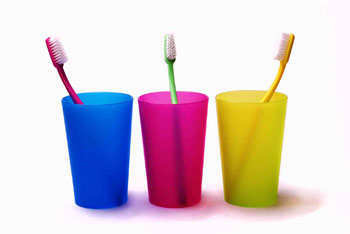 Children should come to learn to brush their teeth either quarterly or semi-annually. Then the teeth will be cleaned, fluoridated and if necessary, sealed. They will also be given helpful cleaning hints. This way the children get used to regular preventive care – an important foundation for oral health. Don’t hesitate – the earlier the better and easier on the child! Deciduous (or baby teeth) teeth have to last longer than many think: the back molars to the age of 11, the next ones up until 8 and the canines until age 9. 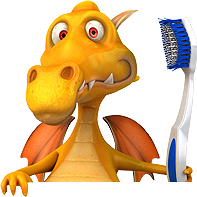 They are not only important space-keepers, they are the precursor for healthy permanent teeth! In our practice we offer the entire spectrum of child-appropriate dentistry. This includes regular check-ups, fillings and crowns for teeth destroyed by decay, root canals and emergency treatment after an accident involving the teeth.